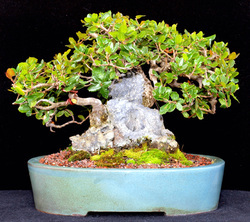 For our July program, Jim Barrett will be demonstrating the "slab method" of hand-building a bonsai pot. With this technique, the clay is worked by hand using only simple tools without the use of a pottery wheel. Pots can be constructed simply and with a minimum of effort. In the slab method, clay is rolled to a certain thickness and pieces are cut out according to selected patterns and are then joined with thick slip pasting and coil “snakes.” The pieces (slabs) may be flat, or may be curved prior to slip pasting. Pots made by this method can be further varied by the addition of ornaments, coil pieces, or hand model-ing. This technique is effective for building pots with flat or single curve surfaces such as square or rectangular shaped pots. Visit the club library to check Bonsai Today issue #54 for an article which describes Jim's creation of a huge (40" x 31" x 10") bonsai pot for a large Ponderosa pine at the National Arboretum. The pot required approximately 230 pounds of clay. By age 14 he would have set up his own lath house and was growing vegetables from seed. By age 23 he would become a fireman in Alhambra, CA, serving 35 years, 17 of them as a Battalion Chief. Early on he would have seen a "Ming tree" in the home of a friend. Several years later he would order some elm seed by mail and begin on his own. By 1955 he would be married, have his own house, and that fall make his first real attempt at bonsai. His teacher would be the elderly and not very talkative Mr. Kishi at the San Gabriel Nursery. In the spring of 1959 Jim would meet Khan Komai and initially do some woodwork at the latter's new nursery. One day when the two of them were at the nursery someone would come in and inquire about bonsai classes. With the help of Frank Nagata, Komai's father-in-law, a systematic presentation would be worked out and classes take place. Jim would thus become the first non-Japanese instructor in the country to teach organized bonsai classes. In a few years the group would form the Santa Anita Bonsai Society and Jim would be its first president. He would chair the National Bonsai Convention '74 hosted by the California Bonsai Society, in conjunction with BCI and ABS. Barrett would be the vice-president of BCI from 1973-74, president from 1975-76, and in 1978-79 the first president of the new Golden State Bonsai Federation in California. He would be an ABS Director in 1983, 88, 91-94. He would write at least eighteen articles for the BCI Bonsai magazine. In 1975 he would begin to make bonsai pots, and by 1978 have his own kiln. He would also become quite proficient with the dwarf mutation of the common Chinese elm ( Ulmus parvifolia ) which he named after its discover, the [John] Catlin elm. Boxwoods beginner's class with Martha Choy continues. Elms beginner's class students with 'lyn Stevenson should bring their class elms for follow-up. This follow-up was delayed due room 101 not being available in June. January 2104 pines with Fred Miyahara workshop participants should bring in their class pines for follow-up. This follow-up was delayed due room 101 not being available in June.